"I love strong opponents! It's such fun to break their backs! said the Leningrad interrogator Shitov. And if your opponent (e.g. your prisoner) is so strong that he refuses to give in, all your methods have failed and you are in a rage? Then, don't control your fury! It's tremendously satisfying, that outburst! Let your anger have its way; don't set any bounds to it. Don't hold yourself back! That's when interrogators spit in the open mouth of the accused! And shove his face into a full toilet! That's the state of mind in which they drag Christian believers around by their hair. Or urinate in a kneeling prisoner's face! After such a storm of fury you feel yourself a real honest-to-God man!" It's been all over the press, on TV and in newspapers. Mel Gibson, the famous movie actor and director, has been horribly slandered, defamed, and verbally mauled by the Jewish elite who uniformly hate and despise Gibson's powerful film, The Passion of The Christ. The ADL, the Simon Wiesenthal Center, and other racist anti-Christian hate groups have made Gibson their whipping boy now for over a year. But, hold on! You think Gibson has been treated unfairly, you haven't seen anything yet. 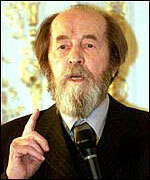 Consider the case of Nobel Prize-winning historian and writer Aleksandr Solzhenitsyn. The Jews have been ripping into, slandering and otherwise savaging the reputation of the solidly Christian Solzhenitsyn for some four years now. But unlike the Gibson affair, the controlled media disingenuously refuse to report it. Solzhenitsyn is the hapless victim whose brutal mental whipping and emotional beating the world knows nothing about. It now seems aeons ago that the stoic Russian author was celebrated for his insightful, poignant accounts of the horrible, subhuman treatment of the victims of the Soviet Communist Gulag, an interlocking system of thousands of concentration and slave labor camps. Solzhenitsyn himself had been a prisoner of the Gulag for a decade, preventively jailed for nothing more than the fear of the communist overlords that he might someday write something the Kremlin masters might find offensive to the state. Solzhenitsyn: The "Conscience of the 20th Century"
Historian Solzhenitsyn's gut-wrenching book, Gulag Archipelago, went through countless printings—in over 50 languages—and touched the hearts of westerners. Expelled by the Kremlin for telling the awful truth, this great man was honored by freedom-loving people both in the United States and in Europe. He was often called the "Conscience of the 20th Century" and recognized universally as one of the globe's prime examples of bold courage and moral conviction. Even the liberal press initially had nice things to say about Solzhenitsyn. They were reluctant to go up against a man so honored for high moral stature, and recognized by so many as a truthteller of the highest character. Then, the historian and truthteller Solzhenitsyn made what was, to liberals and communists, a grave error. Asked at a press conference his opinion on why the terrible events behind the Iron Curtain had occurred, why millions were carted away, tortured, starved and worked to death in Gulag slave camps, Solzhenitsyn gave this simple, yet startling, response: "Man has forgotten God." The brave Aleksandr Solzhenitsyn, the famous Russian writer who has been called the "Conscience of the 20th Century," served eight long years in the Soviet Gulag prison system. Today, he is hated by top-level Jews in America and around the world because he exposed the Jewish leadership of the genocide of 66 million Communist Gulag victims. Many victims were Christians. "What did you say? God? Outrageous!" the critics roared. Immediately, the world's press began a reversal of opinion about this man they once had lionized. Some called him a "Christian fanatic." Others said Solzhenitsyn was "reactionary...right wing...a religious nut." Then, in 2000, Solzhenitsyn released a blockbuster new book he had penned entitled Together For Two Hundred Years. The new book was a lengthy treatise, a thorough and far-reaching compilation of several decades of research by Aleksandr Solzhenitsyn into the machinations for two centuries of Jews inside Russia and the Soviet Empire. 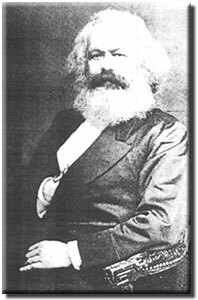 Karl Marx, the Jewish radical who inspired Lenin and Trotsky with his communist theories, was secretly a High Priest of Satan (see Richard Wurmbrand's book, Marx and Satan). Shown here in his official portrait, Marx is giving an enigmatic Masonic hand sign (see Richardson's Monitor of Freemasonry, p. 74). Accurate in every detail, painstakingly documented, the author showed how, over the centuries, a small band of revolutionary Jews had conspired and plotted to overthrow the Russian Czars. Their aim: seize control of Czarist Russia and establish a beachhead for a Jewish utopia on planet earth—the long sought after Kingdom of the Jews. With staggering implications, Together For Two Hundred Years showed how Lenin, Trotsky and other Jewish conspirators had overthrown the Romanov dynasty in 1917 and set up their own Bolshevik totalitarian system. The result: The nightly assassination and roundup of thousands of innocent men, women, and children, most of whom were herded by black-hearted Big Brother secret police into thousands of monstrously evil Gulag concentration camps. The largest number of victims, Solzhenitsyn reports, were Christian believers, understandable since the revolutionary Jews despised and hated Jesus and His Chosen People, the Christians. All-in-all, about 66 million innocent people were kidnapped and eventually died a hideous death at the hands of the Jewish "Ivan the Terrible" corps. 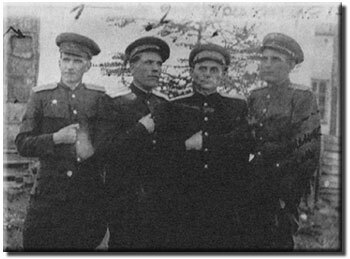 Four Gulag camp commandants. Note that all four are giving the secret sign of Jewish Freemasonry, just as did Communism's founding father, the Jewish Mason, Karl Marx. 66 million murdered by mostly Jewish Gulag overlords! That's over ten times the number of Jews claimed to have been slain in Nazi concentration camps. Obviously, such a powerful—and truthful—book as Together For Two Hundred Years must be suppressed. And it has been. No English-speaking publisher, either in Britain or in the U.S.A. has dared to publish it. So far, Solzhenitsyn's book has only been issued in the Russian language. Shamelessly, yet quietly and without a lot of fanfare, Jewish organizations have put out the word: "Crush this insolent wretch, Aleksandr Solzhenitsyn. Give his works, his voice no forum, kill him with neglect. If you must mention his name, say it with scorn and with taunts and ridicule. Punish him severely for attempting to reveal our secrets to the world. Let him be an example of what the Jewish Power can do to a man who stubbornly refuses to tow the Zionist party line." I have seen what they have done to Solzhenitsyn. I have read their biased and spiteful reviews of his book in the controlled media and witnessed their revengeful hatred of him in countless Jewish magazines, websites, and journals influential but relatively unknown to the public at large. The ruthless Jewish Power clique works to kill men in a variety of ways. With Mel Gibson, it was more public. With Solzhenitsyn, it is more personal and private. Clearly, Solzhenitsyn's writings about the Jewish leadership of the Soviet Holocaust is viewed as a grave threat to the Jewish Plan for global supremacy. In Russia, millions of people—many of them survivors of the Gulag—still love and respect the aging man of God, Aleksandr Solzhenitsyn. They have read his newest book, and they know it is true. They lived it! They also well understand why such a book is being kept from the American people. The Talmudic Jews are fiercely determined that the whole truth about their repugnant, geno-cidal crimes be covered up. Solzhenitsyn's reputation must be progressively tarnished and his writings buried forever. So now, the man, Solzhenitsyn, who suffered under the Jewish Gulag tormentors for so long, must now be tortured once again, and for the same purported "crime," the offense of using "words." It was Lenin who once said, "Words are more deadly than bullets." Leninist ideology is truly an exemplar of the poisonous Talmudic Jewish mindset. Today, in America, there are, consequently, many things a man cannot say, cannot write about, and cannot publish. I know. I have, myself, faithfully followed God's calling and done my best to follow in Solzhenitsyn's footsteps. The Jewish holocaust revisionists have punished me, too, and they continue today to threaten and bully whip me and Power of Prophecy ministries. Like Mel Gibson and Aleksandr Solzhenitsyn, Texe Marrs is now being falsely and cruelly branded an "anti-Semite," a "Jew-hater" and worse, on all seven continents. Fascinating, isn't it, how much fury, venom, and wrath just a touch of truth can whip up among the Jewish overlords and their Gentile accomplices, who today guide Western culture and minutely monitor and control every aspect of media reporting on politics, economics, and religion. 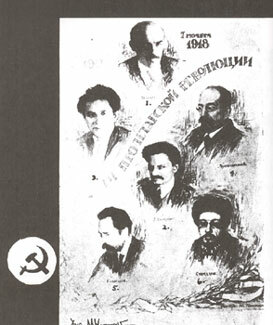 This official postcard, widely circulated by the Communist government in Russia following the Jewish Bolshevik takeover, is entitled "Leaders of the Proletarian Revolution." The postcard reveals the Jewishness of these original leaders of the Communist Party. All six shown, including Lenin and Trotsky, are Jews! Their greatest hatred, their most vicious spewing of venom, is reserved for the fearless few who dare to reveal to the world the heinous crimes committed by the Jewish Power in the Communist Gulag, especially the Zionist murder of 66 million men, women, and children, many of them Bible-believing Christians. Equally hated are men like Ernst Zundel of Canada, who have questioned whether six million Jews actually died in a Nazi Holocaust. But even if six million died in a Nazi Holocaust, what of the sixty-six million who perished in the Jewish Gulag? And remember: Thousands of Nazis have been tracked down and punished for their reported crimes against humanity. Why is it that not even one Zionist Jew has ever been brought to justice for the heinous crimes committed in the Jewish Communist Gulag? Why? For almost six decades, America and the planet have been preaching to the Germans, reminding them of the terrible crimes of their Nazi ancestors. It is only fair and just that we all now turn our attention to the Communist Gulag Holocaust, that we expose the Jews' role in its monstrous crimes and remind the Jews of what their criminal ancestors did to these sixty-six million innocent victims, most of whom were Christians. Isn't it also time we demand construction of a Christian Holocaust Museum in Washington, D.C., to be erected next door to the existing taxpayer-funded Jewish Holocaust Museum? Is only the suffering of Jews worthy of being memorialized? What about the pain and suffering endured by so many other ethnic and religious groups, including that of Russian and Eastern European Christians during the Jewish Bolshevik era? Don't these tens of millions of Gentiles killed and tortured deserve to be remembered as well?